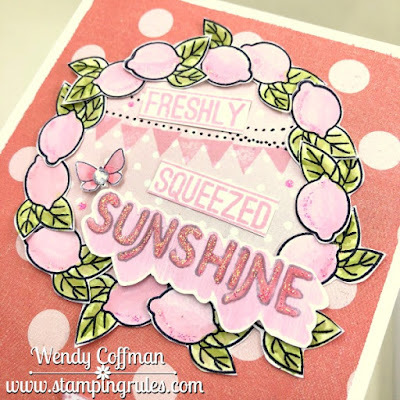 Hello, Stampin' Friends! I wanted to squeeze in one more May SOTM project before this stamp set rolls away at the end of May. This week's Atlantic Heart's Sketch Challenge included a sweet wreath element, and I thought, "What about a wreath of lemons?" I'd already done yellow lemons, and this big pink Polka dot print from Beautiful Friendship caught my eye and I thought, "What about PINK lemonade?" Aaaaaand, then the sun just smiled down on this project! I stamped a bunch of lemon clusters, which I colored in using Pixie Ink, Fern Ink, and my Bashful pink Shimmer Brush. After a satisfying session of fussy cutting (am I the only one who finds that soothing?) I trimmed a circle out of the pale pink dotted paper from Central Park and used the edge of the circle to adhere my lemons into a wreath shape. Before adding the lemons I stamped the dotted banner and tiny banner images from the SOTM across the circle. 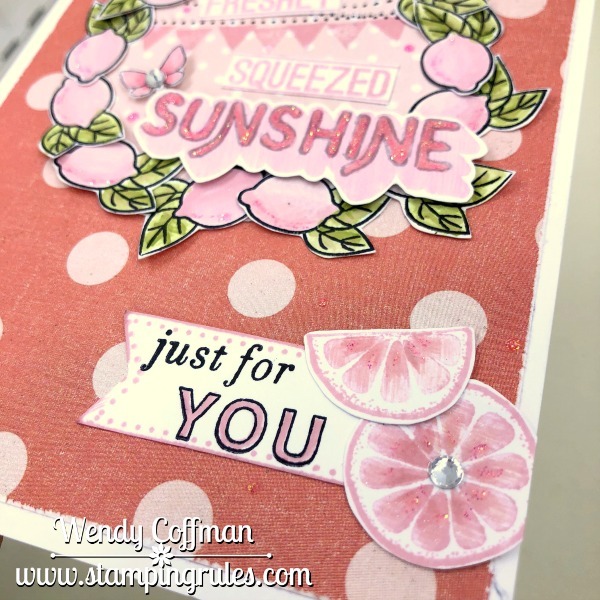 I decided I wanted to have this be a cheerful Friend card, so I got out the Central Park - Scrapbooking stamps and stamped the cool 2 step Sunshine sentiment using Pixie Ink. How cool is that dropped shadow? I painted over the SUNSHINE letters with more Pixie Ink picked up with the Bashful Shimmer Brush, and did a faint skinny outline with a pale gray Zig Clean Color brush tip marker for a bit more emphasis. I trimmed out the SUNSHINE sentiment and popped it up with thin 3-d Foam tape. I stamped the FRESHLY SQUEEZED label image and carefully trimmed out the two words I wanted to complete my wreath center and sentiment. I decided to embellish the bottom banner from the AHSC sketch a bit with some ink rolled lemon slices. I used more Pixie Ink picked up with the Bashful shimmer brush to deepen the slice centers. The Just for YOU sentiment (and that teensy butterfly) is recently retired from Chelsea Gardensin the last Expressions book, and I outlined it using the delicate dotted line image from the SOTM set. I love all the little extras in this lemony SOTM set, like the dotted lines and banners and the striped straw that makes an excellent border (not to mention that large mason jar - swoon!). When life gives you lemons, you really make something of them!!! Your card is bold and fun and eye catching!! I don’t know where to start with all the “juicy details” - you really put a lot of work and love into this card. I’m sure it will cause a big smile for someone special. Very delightful and fun card, love the layering. Thanks for sharing with us at Heart2Heart. So adorable, I love the soft pinks and the details, so cute! Thanks for playing along with Heart 2 Heart Challenges (H2H).